Restore your washing machine’s squeaky-clean reputation with these must-do tips for removing musty odors. Q: Lately, every time I open my washing machine door, I detect a foul-smelling odor—not the fresh scent of clean clothes. Help! How do I get rid of it? A: Sorry to hear your sniffer is suffering! It looks like it’s your washer that is in need of a washing. Odors that waft from your washing machine are commonly caused by a combination of the following contaminants: mold, mildew, and bacteria. 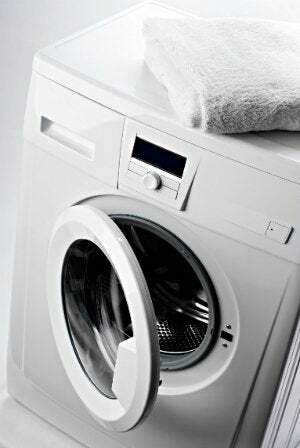 Over time, soap scum, dirt, body oil, and hair get trapped inside the washer’s seals, gaskets, and dispensers. Without regular cleaning, your washer ends up smelling about as disgusting as that collection sounds. Combine that toxic concoction with your laundry room’s constant humidity, and you end up with an ideal environment for bacterial growth. And therein lies the irony: The machine you rely on day after day—cycle after cycle—to remove soil and stains now smells worse than your dirty laundry. Sometimes, even the hardest-working appliances need a little TLC to get back on track. To remove those foul odors, use the following three-step process to restore your washing machine’s clean, fresh scent: scrub, sanitize, and deodorize. To begin cleaning, remove the soap, bleach, and softener dispensers so you can scrub them individually. When water gets splashed into any of these parts, it is often left behind as standing water between cycles—a breeding ground for mildew. Use an old toothbrush to get inside the cracks and crevices, and a pipe cleaner to dig out buildup lodged inside the pipes of the dispensers—that’s a sneaky source of moldy smells. If you have a front-load model, also wipe around the rubber seal with a wet cloth, and use a Q-tip to remove accumulated gunk around the gasket. On top-load models, pay special attention to the cracks and crevices around the doors where dirt tends to hide. When you’re done scrubbing the parts, it’s time to move on to the tub. To sanitize the machine, keep chlorine bleach on hand as your “go-to,” as it’s the absolutely best solution for killing mold and mildew. Just be sure to take precautions when using this product and, for safety reasons, don’t mix it with other cleaners. Now, set the washer to the highest possible temperature setting. The amount of bleach you should use depends on your appliance: Add four cups bleach to a top-loading machine or two cups to a front-loader, then start a cycle. Let the tub fill, and stop the wash cycle once the agitator has mixed in the bleach. Allow the bleach water to sit for 30 minutes, and then resume the cycle. One more run of the rinse cycle should remove all traces of bleach. Once the bleach has done its job sanitizing, move on to vinegar to remove any last lingering smells. Vinegar is not only an excellent deodorizer, but the acidic quality of the liquid removes hard water buildup as well as any leftover bacteria that may have survived the bleach. To begin, set your washer on its hottest setting. Add four cups of plain white vinegar (not balsamic or apple cider) to a top-load machine or two cups to a front-load model. 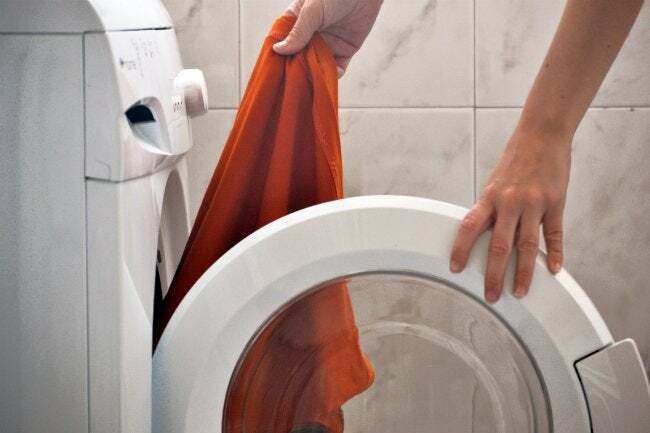 Don’t use laundry detergent or anything else in this cycle—vinegar acts alone! The process from this point should feel familiar: Allow the tub to fill, then stop the wash cycle once the agitator has mixed the vinegar and water. After 30 minutes, turn the washer back on and allow the cycle to resume until complete. The next time you open your washing machine door, don’t be afraid to breathe in deeply! Instead of that foul-smelling odor, you’ll enjoy the sweet smell of success.